I was having tea with a friend the other day and we were having a chat about all sorts of things. Her response to one of my statements was “oh, that is so random”. Used informally, this means unknown. I prefer to use the word to mean out of place. Since that conversation, the word random has become my new catch word. I have found myself using it to describe all sorts of occasions and things. The other night we were having dinner at a friend. We had organized to come over to his place at 6pm with the food and braai for him as he is unable to stand at the BBQ himself due to having had a total knee replacement. He and his wife were not there when we arrived, prompting my first use of the word random that night. Then someone arrived at dinner time, unannounced for a drink – random! And even though he said he was not staying for dinner, our friend’s wife set a place for him at the table and not for Dave – random again! 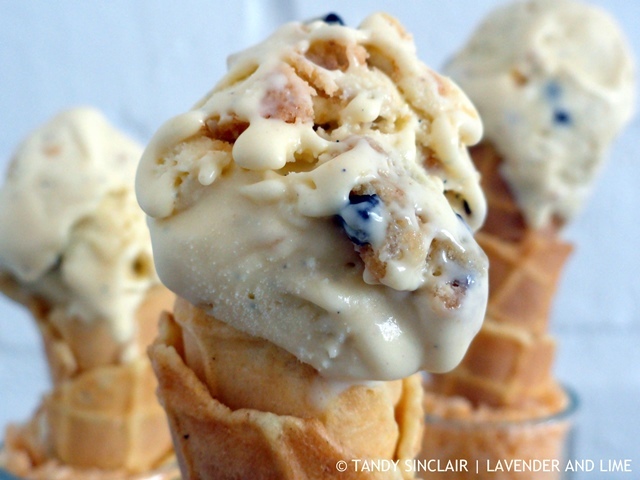 In this cookies and cream ice cream you will find random bits of soft, chewy cookies that are not out of place. I steered away from the traditional addition of cream filled hard cookies for this recipe, and used something that has a fudge like quality. This is one ice cream I will be making more of for sure. Do you have a catch word? I have used soft cookies in this ice cream which adds a fudge like texture. This sounds really delicious, Tandy. Oh Tandy, the idea of cookies in the ice cream just make me want to have some now…even with the cold weather…looks delicious! Tandy, cookies and cream are my weakness. I can’t wait to give this a try. My kids would LOVE this ice cream. I love cookies and cream ice cream but I’ve never made it! Bet this is amazing. You can’t go wrong with ice cream that contains cookies! Two things that are enticing even on their own. It looks so creamy and the little crunchy bits are the ideal contrast. Yes, love that word – random – I have a few nieces and nephews who use it! Yes, it’s a great word – random – I have nieces and nephews who love the word! Looks gorgeous – would love to give this a go. My mum says “at the end of the day” a lot – to which my brother and I often add “it gets dark” …which drives her mad!!! ha ha, I must remember that as a friend uses the term all of the time! it is worth getting one! Tandy, I am absolutely drooling over your cookies and cream ice cream. It has always been a favorite! I want this over those waffles you made. For breakfast to give me a pick-me-up. I have never made my own ice cream before but would love to think I could! yes! This is my favorite ice cream flavor! I love this recipe so much! I want it so bad! But before preparing one… I need more space in my fridge, it’s full…. I quite like the word ‘Exquisite’, which suits this ice cream nicely.